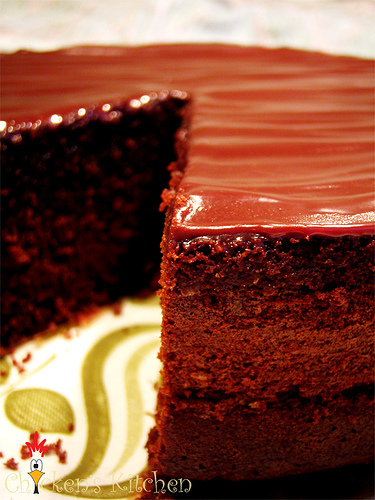 Chocolate cakes are hard to say no to because of its enticing flavour. Mastering the right recipe is the key! Find the delicious recipes for chocolate cake. Nothing satisfies quite like an indulgent piece of chocolate cake. You will also need two layer tins with removable bases. This recipe was created using tins that were 8 inches in diameter. Decorating the cake with sugar flowers, fruit, nuts or other decorations is optional. Begin by taking ingredients such as the butter, eggs, sour cream and chocolate out of the refrigerator so that they can reach room temperature. While you are doing this, preheat the oven to 350 degrees farenheight and prepare your cake tins. You can either dust them with flour, butter, shortening or spray them with nonstick cooking spray. Combine the wet ingredients such as the butter, eggs, vanilla, sugar and sour cream in a food processor. Slowly incorporate the dry ingredients including the flour, cocoa, baking powder and baking soda. Mix until your batter is thick and smooth. Once your batter is completed, divide the batter between the two prepared cake tins. Use a rubber spatula to clean the bowl to help ensure that no batter is wasted. Place the pans in the oven and bake for 35 minutes. Depending on the function of your oven you may need to begin checking your cake for doneness at 25 minutes. You may also need to rotate the pans if it appears as though one tin is cooking more quickly than the other. Your cake is finished cooking when you can insert a toothpick into the center and it pulls out with no batter on it. When the cake is done baking, let the cakes cool for at least 10 minutes and remove them from their tins. Allow the cake to cool completely before you begin frosting as a warm cake will cause your icing to melt. While the cake is cooling, melt your chocolate and butter for the frosting in a large bowl. You can either do this by slowly warming it in the microwave or by creating a double boiler on the stove using simmering water. With either application, be sure to heat these substances slowly and stir frequently or your chocolate will seize or burn. Once the chocolate and butter are melted and combined, allow it to start cooling. Use a sieve to break up any clumps in your powdered sugar. You may also use the food processor for this step. Pour the confectioners' sugar in a separate bowl from your wet ingredients. Add the corn syrup, sour cream and vanilla to the butter and chocolate mixture, then gently whisk in the confectioners'sugar. If you had broken up your confectioners' sugar in the food processor you can add the chocolate mixture and other ingredients to the sugar by pouring it down the spout of the processor while the motor is running. If the mixture seems too thick, add a teaspoon of boiling water to help loosen it up. You can also add more powdered sugar if the mixture seems too loose. Now it is time to frost the cake. Fetch your cake stand of choice and place 4 strips of parchment paper around the edges. Place your cake on top of these strips, but allow the edges to hang out for easy removal. This will help prevent icing from dirtying up your plate as you frost. Spoon approximately 1/3 of your frosting onto the center of your first cake round and use a flat knife or spatula to spread it evenly. Then set your second cake round on top of this one, gently pressing them together to form a sandwich with the frosting. Spoon another third of the frosting on top of the cake and gently spread it using a swirling motion to create texture. Continue adding icing and gently push the icing down the sides of the cake until the cake is covered. If you like, once the cake is covered you can wet your knife and use it to create a smooth texture. Allow the icing to set for a few minutes, then remove the parchment strips, and add any optional garnishes you would like. Serve and enjoy! Spoon icing onto the top of the cake, gently swirling it across the top and down the sides until the cake is covered. Allow it to set before removing the protective parchment strips and garnishing.